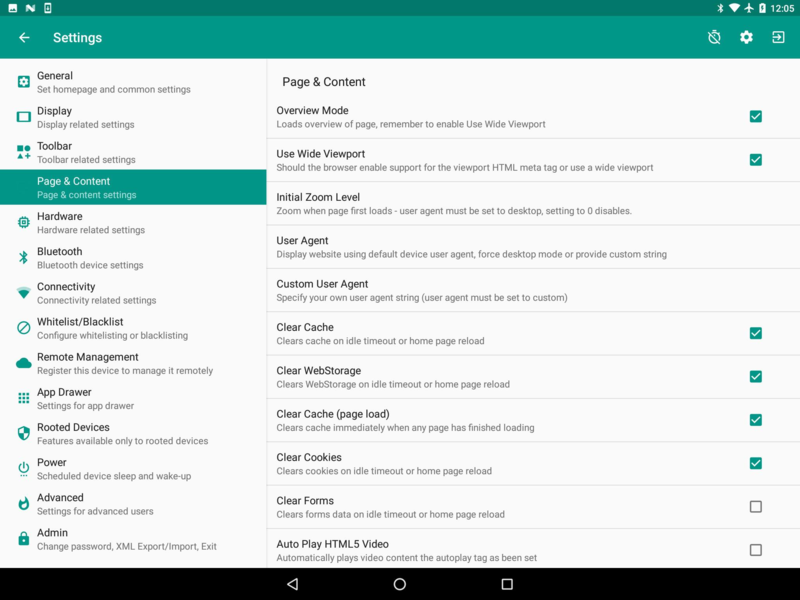 The options to Clear Cache, WebStorage, Cookies & Form Data can be found under Settings > Page & Content. Enabling this option, will clear the cache on idle timeout or home page reload. The browser cache is a temporary storage location on your devices for files downloaded by your browser to display websites. Files that are cached locally include any documents that make up a website, such as HTML files. Enabling this option, will clear the WebStorage on idle timeout or home page reload. WebStorage is used to store data on the device without using cookies. Saved data persists in the browser until it is explicitly removed. Enabling this option, will clear the Cookies on idle timeout or home page reload. A cookie is a file created by a web browser at the request of a web site, that is stored on a device. These files typically store user-specific information such as selections in a form, shopping cart contents, or authentication data. Enabling this option, will clear the Forms data on idle timeout or home page reload. The forms data is any information that has been entered into a web form, and could be revealed to other users if it is not cleared between sessions. 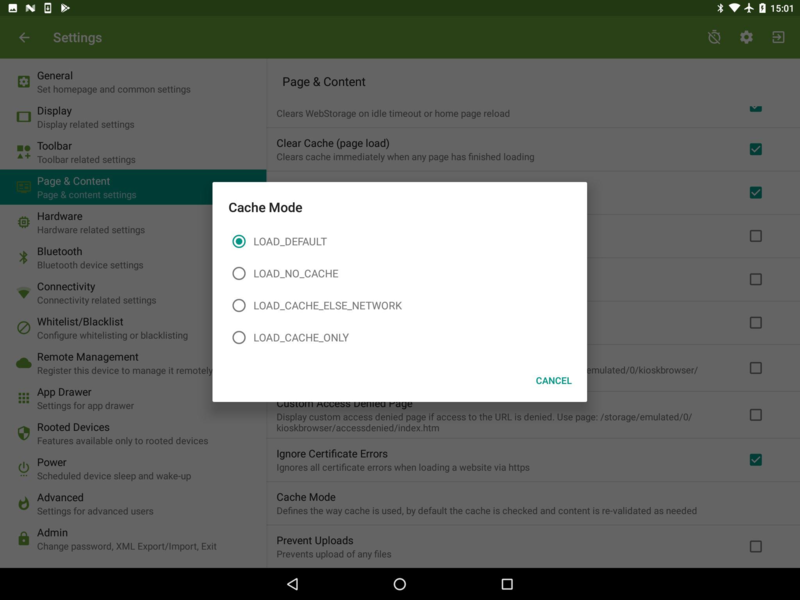 This option overrides the way the cache is used. The way the cache is used is based on the navigation type. For a normal page load, the cache is checked and content is re-validated as needed. When navigating back, content is not re-validated, instead the content is just retrieved from the cache. This method allows the client to override this behaviour by specifying one of LOAD_DEFAULT, LOAD_CACHE_ELSE_NETWORK, LOAD_NO_CACHE or LOAD_CACHE_ONLY. Google provides more information on these modes here. These modes are provided "as is" and the only supported mode is LOAD_DEFAULT, this being the default value. The size of the WebView cache is defined by the WebView, this cannot be changed. Using these settings in conjunction with the various Automatic Page Load Options, gives you a vast amount of control over how and when the device clears potentially sensitive data.